When the engineers at Sphero looked at current robotics platforms they discovered two issues. Some robots required a great deal of work and time to get to full functionality, and some were easy to bring to a useful state but then disappointed when it came to end state content. Their goal for the new RVR platform was a platform easy to use right out of the box with a platform that inspired users to do more and more with the robot. Their project RVR is currently running a crowdfunding campaign on Kickstarter. RVR includes a light sensor, RGB sensor, 9-axis inertial measurement unit, infrared sensors, 20-pole magnetic encoders, and ten individually programmable RGB LEDs. The bot is driven with wide tank treads and a 20 millimeter clearance underneath with an eye on rough surface driving. Current payload is 2 pounds but the group is hoping that with testing that limit can be increased. Programming can be done first through the Sphero Edu app using a combination of lines, block programming and text. Beginning control comes from the app and its built-in joystick with the added ability to control the ten LEDs. The universal mounting plate is designed to hold accessories and the software development kit is already compatible with Raspberry Pi, Arduino and BBC Microbit with plans to expand to iOS and Android. 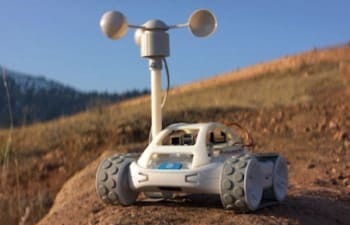 A four pin Universal Asynchronous Receiver Transmitter (UART) is also included, and the campaign video shows laser attachments, a WiFI camera, a weather system and a bubble blower all powered by the system. One idea that really comes across in this campaign material is that Sphero knows robotics. They’ve been around since 2010 and I’ve always known them as the company that makes the big BB-8 robots popular when the newest Star Wars movies were released. Now they’ve developed a robotics platform and are using their educational platform to really push people from every skill level to get a robot and customize it with new and advanced functions. The campaign is offering 5000 special Kickstarter units, is already successful on its first day, and will end on March 21, 2019.